Former Funcom Chief Trond Aas is under investigation for attempting to sell 1.5 million shares in the company immediately prior to the launch of The Secret World. Funcom's latest MMO The Secret World launched to what some might call a "mixed" critical reception, and it hasn't been a big hit with fans. The company acknowledged in its second quarter financial update that "initial sales of The Secret World have been below expectations," to the point that it was forced to lay off roughly half of its overall staff, including the game's lead designer; its share price has since tumbled from over $17 at the beginning of July to $2.23 today. That's where it gets ugly for Trond Aas. Funcom announced on July 2 - the day before The Secret World went live - that he had stepped down as CEO and would instead serve as "Strategic Advisor to the Board and Chief Strategy Officer." There's nothing wrong with that, but according to an anonymous insider "familiar with the situation," Aas actually stepped down in order to get off Funcom's "primary insider list," which would allow him to sell his shares in the company without attracting scrutiny. "As a primary insider, all of Trond's purchases or sales of Funcom shares would have had to be announced to the Oslo Stock Exchange (OSE). After getting off the primary insider list, Trond tried to sell 1.5 million shares," the anonymous source said. "However, his sale was discovered by another shareholder that subscribes to other shareholder lists, and when Trond's sales became public, Funcom's stock price tanked." Trond was able to sell about 650,000 of his Funcom shares, but is now being investigated by the OSE and Norway's Financial Services Authority. 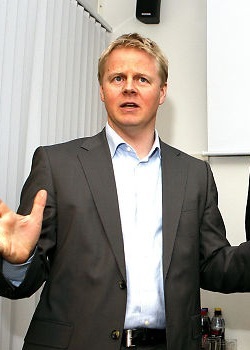 Aas claimed that he has redeemed and sold stock options a few times in the past and that the timing on this sale was purely fortuitous, except for the fact that he's now suspected of insider trading; he also stated that, having resigned as CEO, he knew nothing about the poor sales of The Secret World until the company released a financial update on August 10. Aas said that "it is human nature to think that 'someone must have known something'," but insisted that feedback on the game up to the point when he resigned as CEO was very positive, so he had no reason to even think about getting out before the wheels came off. "Go back to the week [of launch] to look at the data that was available when the decision was made. There was no [one] at Funcom who [had] different insights than what was communicated [by the users]." Nonetheless, he could be facing serious trouble. "It would surprise me if he is not convicted," the source said, "and he might go to jail." The secret worlds setting was actually really interesting to me but the gameplay was basically WOW with modern guns replacing arrows and muskets which is why I never bothered. Plus with it being sub based and me already paying for EVE there was no way I could even afford it even if I wanted to. To be a bit more OT: Didn't this just happen with another gaming company? I find it odd that this type of stuff seems to be happening more often now in the industry, I guess when I hear about this stuff I just think more about serious Wallstreet buinesses and not about people who make games. You mean Zynga? I know that they had a (somewhat) recent bout with insider trading. And I'm not surprised by this at all. Its Funcom, to me I have to expect some kind of totally deserved shitstorm to pop out about their games. They just can't release a title, they have to ensure that somehow a big storm has to pop up around it. It used to be that game company executives were just more interested in running a business than they were in making games. Now they don't even want to do that, they just want the money. Funcom more like Fun con AmIright? Funcom's latest MMO The Secret World launched to what some might call a "mixed" critical reception, and it hasn't been a big hit with fans. You need to check up on your facts, it was and is a tremendous hit with fans, it is critics who failed to see the point of the game. The Secret World is the MMO with the highest user score on Metacritic in 11 years. And to be fair, the two or three lowest scores on Metacritic from critics are troll reviews of 40 and below from sources with no track record, namely blogs. Why those scores are still aggregated you'll have to ask Metacritic, but if you omit them, TSW has a Metacritic score of well over 80. In Another News: People are still waiting for Dreamfall Chapters. "Initial sales of The Secret World have been below expectations, as communicated in the stock notice of 10 August. The Company still considers it likely that sales for the 12 months period following launch of the game will be less than half of what was presented in the Conan-like scenario in 1Q presentation." I have no doubt that pre-release feedback was very strong, and I've heard a lot of good things post-launch, too. That doesn't make it a hit. There's a difference between "a hit with fans" and "a hit with the public". As nearly everyone who were anticipating the game - and truly were fans of the concept - considered the final design a success. I doubt he will be convicted because Aas would have gone over this with a lawyer first. What he has done is unethical but I suspect not illegal. There's a big difference between being good and being a hit. Arkane's previous games, Arx Fatalis and Dark Messiah of Might and Magic, were both good - very good - and have their own little slice of devotees. (Arx in particular.) But nobody would reasonably argue that either of them were "hits." As I said, I've heard some very good things about TSW, but its impact on Funcom speaks for itself. made an Aas of himself. Damnit...stop inside trading and make The Secret World F2P!!! how is inside trading bad? I don't know much about it. Inside trading in laymans terms is having advanced knowledge that the company's stock value will drop and unloading all your shares before this happens. Well at least in this instance, I'm sure there's a lot more too it though. The basic idea is that people who are the top of a company and know things not disclosed to the public can make desicians about their own stocks that other traders on the market could not possibly know, giving them an unfair advantage. The idea kind of being to prevent the guys at the top of companies from trading stocks around between themselves based on inside information and keeping lesser traders out of the game all together. In this paticular case we're looking at another side of things, the basic allegation is that this guy knew the stock was going to tank because he was working for Funcom. Basically he knew The Secret World was a turd that wasn't going to perform to exepectations and lower the share price, based on information the public did not have (having seen the game and the numbers). Thus while hype was high he sold his stock for $17 a share, when it dropped in price to a little over $2 a share he wound up with a pile of money whole the guys he dumped it on took a huge hit. Stocks are supposed to be a gamble, but in this case he knew exactly what was going to happen which is why he decided to sell right then. Think about how you'd feel if you invested in a company that was projecting itself as being a major success and had all of this public information to set it up. You buy the stock, but then it crashes, but in this case it wasn't chance, the guys who had the stock knew for sure it was going to tank and there was nothing behind their public face. Or on a bigger scale envision a situation where a coalition of CEOs juggle stocks around between them to disguise what the actual values of the stocks are, that way low stocks from companies that might recover or might be about to rise never make it onto the open market, etc... only the people on the inside of big companies who can trade insider to insider and make long term deals can thus participate.... this is when you see things where multiple CEOS get in trouble for conspiring to hide the condition of a company (which might be taking in millions of investments while running on empty). If you look at the big financial meltdowns of the last few years with banks going belly up from bad investments, and companies like Enron playing "big boy" whole actally being totally worthless, you can see why Insider trading is a really bad thing, the problem got that bad because insiders were able to hide the actual financial status of their companies. It's more involved than this, but that's the basics, "Insider Trading" is actually a general header for a lot of things that can actually cross a lot of boundaries. It's frequently combined with and used to hide things like Ponzi schemes... a Ponzi scheme being (in it's most basic form) an investment company that takes a ton of money from people in return for promising them more money in the long term, it keeps reporting to the people investing that the money is increasing, but in reality the guys running the scheme just keep the money and use it to live off of and do whatever. It works as long as the people demanding payouts (as oppose to letting their money ride and allegedly grow) don't exceed what has been paid into the scheme by everyone. It can be hard to detect as a result unless a lot of people try and cash out at once, beyond the unspent money actually being held. You can use insider trading to disguise this, or even as a way of setting it up if you are playing the role of a stock investor, after all the less people see your stocks, or the less they are traded (giving the perception of value) the less anyone knows about what your really doing with all of that money. As a beta-tester and someone who committed to a lifetime subscription I will say that I find a lot of this disturbing and somewhat contrary to what I've actually seen going on so far. That said, TSW was a niche product, to begin with, a point which seemed to be understood during the beta, and heck... not trying to be a blockbuster MMO was one of the reasons why I signed up for the long haul. A lot of these projections seem to be implying an entirely differant attitude from the tone of what was going on during the beta and within the community. It's also noteworthy that TSW followed in the same destructive path of other MMOs, namely no real endgame content to keep people playing. I invested in the game knowing this was the case and to give them a chance to produce it, BUT it was also transparent that they weren't going to retain tons of players on a WoW-like level once they finished the storylines, if you don't have an endgame that keeps people busy most are not going to re-up their subscription every month while waiting for you to release more content. This more than the subscription model is what has killed every other MMO to launch. Sure WoW didn't have much of an endgame when it launched, but nobody did, and when it DID launch an endgame Blizzard was smart enough with it's 40 man raids to make sure they were time sinks which people complained about but invested the time into... which allowed them to pace out the content.... but again, this all seemed to be known during the beta. I think what we might be seeing is some kind of divide between the designers (the lead of which was let go) and the financial end of things. Obviously someone out there in the bean counter lands seemed to think this was a promised blockbuster as opposed to a niche title, and was judging success on that level. I mean I can't otherwise see how we can go from "has sold so many units we need another server" to "OMG, this is a tremendous failure", especially when they pretty much knew they weren't launching with an endgame, and chose a premise that is about as niche as you can get to boot. Such are my thoughts and observations at any rate. Basically, by any rational analysis, especially given the vibe before the game's release, this game should have been a hit, at least to the level they were hoping for. As a totally un-verifyable speculation, I'm wondering if the whole thing was some kind of internal scam to make money off of, the guys looking at the finances seem to be in a totally differant reality from those developing and testing the game, this dude's insider trading scam had him making an early move, I wouldn't be surprised if maybe he was responsible for a few wires getting crossed to control the stock prices, screw his own company (perhaps for another one), and jump out on his stock-sales golden parachute. Stuff like that has happened before. The game only sold 200,000 copies, subs will be even less. And the three lowest scores are from G4, Game Revolution and Quarter to Three. I've not heard of Game Revolution, but that's one dubious review of 51. I'd also love to know how you define 'troll scores'. I wouldn't imply it's the steaming turd that Andy insinuates in the article, but you're further off the mark than he is. Acting as if a game with a miniscule fandom because it's popular with all of three people is pretty disingenuous. I see Metacritic have omitted one of the troll blogs, and while Game Revolution is not a blog it's well known in Scandinavia for being of dubious integrity. But what interests me is that you have actually heard of Quarter to Three, a downright offensive website that I tracked back in time to see is amateurish. Both GR and QtT exhibited signs of not even getting into The Secret World before dropping a score, and their "articles" were full of downright lies. Understand that I'm not arguing that the game was not a hit in sales. It was a hit with fans, because 100% of the game's fans bought and enjoyed the game. Your wording in the article makes it sound like fans didn't like the game, while you are trying to say TSW had problems generating new fans. It is offensive to fans and the developers, who succeeded in making the game the fans wanted. Tom Chick's been around for ages - he's pretty well-known. Anyway, how the hell is it "downright offensive" and what pegs it as "amateurish" (other than the site design, which is pretty crap)? And again, "troll scores"? You know what "troll scores" usually means? "This score is really low and it's a game I like. Troll score!". Exactly. I got the game in more ways then one. Andy managed to offend me. I am sure that was not his intent. I am so surprised that someone who has never played the game thinks that the game played like World of Warcraft. The similarities between Secret World and World of Warcraft are much smaller than the similarities between World of Warcraft and most any other MMORPG released in the last five years. Idiot early reviewers who probably based their opinions of the game on half of the opening tutorial are the reason people believe this game is anything less than the most fun and engaging MMORPG ever (which it is, by the way, in the opinion of my tried-most-every-MMORPG-since-being-in-the-Ultima-Online-beta self). Sounds like a fanboy trolling here then anything else. If this game was so great and amazing then it wouldnt be in so much trouble, and pretty much on the verge of going F2P. Just because you and all 4 of your friends love the game in no way makes it anything of a success or a hit. Its just delusional fanboyism, it sounds like when the game completely fails you'll still be clinging to the idea the game is a success instead of facing reality. 1. TSW had an amazing following from the early days, first triggered by people's expectation that Tornquist will deliver on another awesome story like he did in Dreamfall/TLJ, second, by the marketing hype that this MMO will be completely different, and third because of the cool conspiracy spin and all the Alternate reality game shebang. Towards the end of development, almost a year before release, the ARG had wound down, people knew most of the story that was in Tornquists head had remained safely there(!) and that our game was not much different than any other MMO. The combat system, in particular had been changed around so many times that almost everyone was sick of it - few saw merits in it. So that's what most developers thought - our fans on the other hand were awesomely patient with us, and forgiving with the faults of our game. 2. I always thought that it was weird that Trond Aas was downplaying the fact that we had issues, and towards the end kept acting like we had hit a gold mine with the game. People would look at him in disbelief when he claimed that 1.2 million people had logged in at some point or another during the beta to play the game and then him and his crew kept giving us cooked numbers to support the fact that soon all of us will be rich from the stock option we had gotten if we went ahead and purchased them stocks. It made no sense to me back then, especially since Trond had always tried to scare us into working harder and making a better game in the two years running up to the release of Age of Conan, I guess I know now why he wanted to synthesize the hype - that even we developers knew was not justified - and believe me, our projects are our babies, so we love them, even when you hate them. 3. TWS had potential - it still does. It will hopefully rebound, even if it does so slowly, and it will do that despite Trond's dubious trades and lies and greedy behavior - it will rebound because of the great fans it has, and because at this point we have no other option than to make this work. Unfortunately pretty much everyone I had any respect for was laid off recently, but we will fill in for them, and will try our hardest to make this right and if any of our managers are reading this I want you to know: for each one of you who messed up the game and got to stay, two great employees who warned you all along of the shortcomings of the game were fired so value the second chance you got. 4. To Trond: I am glad you have left one way or another - acting like you care about a game, when you are not willing to take any of the steps necessary to get it right, and only thinking about your bank account when you see a ship sinking (yes, you DID have pre-release sales numbers, and yes you knew how many people spent how many hours in the beta servers) is disgusting, and we don't need people like you in the industry. You used the company as your personal piggybank, and you didn't shy away from breaking it in the end. 5. To our fans: we will try hard to do the right thing by you, even if it means not getting paid for a while. You did your part, we will do ours.